Those who are unfamiliar with Venezuela’s unprecedented economic collapse might be surprised to learn that the country’s oil production has only slowed, even as the price of a barrel of crude has risen in most international markets. 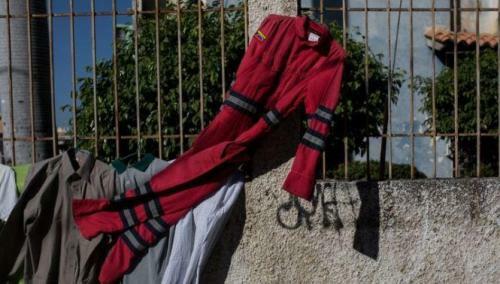 Unsurprisingly (it’s Venezuela), there’s a macabre explanation for this phenomenon: The workers at PDVSA – Venezuela’s state-owned oil company, which once showered Venezuelans with oil wealth – are literally collapsing due to hunger and exhaustion as workers defy their government handlers and flee their jobs in their desperation as the value of their pay has been completely erased. Bloomberg spoke with several workers in Venezuela’s oil industry about the harsh conditions they face on a daily basis. Of course, oil workers aren’t the only ones suffering: The situation in Venezuela is getting so dire that ordinary Venezuelans are losing tons of body weight because of the food shortages. Many can no longer afford to buy meat. One worker told Bloomberg about how his weekly salary barely pays for the corn flour he mixes with water and drinks every morning. At 6:40 a.m., Pablo Ruiz squats at the gate of a decaying refinery in Puerto La Cruz, Venezuela, steeling himself for eight Sisyphean hours of brushing anti-rust paint onto pipes under a burning sun. For breakfast, the 55-year-old drank corn-flour water. Ruiz’s weekly salary of 110,000 bolivares — about 50 cents at the black-market exchange rate — buys him less than a kilo of corn meal or rice. His only protein comes from 170 grams of canned tuna included in a food box the government provides to low-income families. It shows up every 45 days or so. Hunger is hastening the ruin of Venezuelan’s oil industry as workers grow too weak and hungry for heavy labor. With children dying of malnutrition and adults sifting garbage for table scraps, food has become more important than employment, and thousands are walking off the job. Absenteeism and mass resignations mean few are left to produce the oil that keeps the tattered economy functioning. Researchers at three Venezuelan Universities reported losing on average 11 kilograms (24 lbs) in body weight last year and almost 90% now live in poverty, according to a new university study on the impact of a devastating economic crisis and food shortages. That annual survey has become a key barometer of the country’s economic stress since the government stopped releasing reliable economic data, as Reuters reports. Per Reuters, over 60% of Venezuelans surveyed said that during the previous three months they had woken up hungry because they did not have enough money to buy food. About a quarter of the population was eating two or less meals a day. After winning the presidency in 1999, leftist President Hugo Chavez was proud of improving Venezuela’s social indicators as the country’s economy was bolstered by oil-fueled welfare policies. But his successor President Nicolas Maduro, who has ruled since 2013, has allowed corruption to flourish. And his political allies have mismanaged the economy to such a degree that the collapse in the price of oil during 2014 had ruinous consequences. Even as the price of crude has begun to creep materially higher, the situation in Venezuela is only getting worse. In contemporary Venezuela, currency controls restrict food imports, hyperinflation eats into salaries, and people line up for hours to buy basics like flour. As a result, 90% of Venezuelans live in poverty. In what appears to be a last-ditch effort to rescue the country’s economy and his regime, President Nicolas Maduro yesterday began sales of the Petro, Venezuela’s oil-backed cryptocurerency. The launch was so successful, Maduro has assured the public, that he is considering launch a “Petro Oro” – a cryptocurrency backed by gold reserves. For decades, PDVSA was a dream job in a socialist petro-state. The company supplied workers not only with a good living and revolutionary-red coveralls, but cafeterias that served lunches with soup, a main course, dessert and freshly squeezed juice. Now, the cafeterias are mostly bare, the children are hungry and employees are leaving to work as taxi drivers, plumbers or farmers. Some emigrate. Some hold out as long as they can. … Now, instead of enjoying the trappings of a comfortable, middle-class life (not to mention freshly squeezed fruit juice), desperate employees are risking the government’s wrath – and possibly sacrificing their chance at a government pension someday – to escape not only from their jobs, but from Venezuela. Those who quit without notice risk losing their pensions, as bureaucrats refuse to process paperwork. Many managers live in terror of arrest since the Maduro regime purged the industry, imprisoning officials from low-level apparatchiks to former oil ministers. In one human resources office, a sign advertised a limit of five resignations a day. “Management is holding them back to stop brain and technical drain,” said Jose Bodas, general secretary of United Federation of Venezuelan Oil Workers. He estimates 500 employees have resigned at the Puerto La Cruz refinery and nearby processing facilities in the past 12 months – even though superiors have labeled them “traitors to the homeland,” a phrase that often precedes arrest. In the streets, families sell their boots and the red coveralls. In a nightmarish reflection of what life must’ve been like in some of the most poverty stricken areas of the Soviet Union, widespread adsenteeism is forcing those who stay behind to work long hours at the state’s insistence – without any additional compensation. Sitting in the living room of his house, on his day off, Endy Torres says he has lost 33 pounds over the past 18 months. He shows his PDVSA identification photo as proof: a chubby-cheeked man, weighing 176 pounds. Ten years ago, he joined the company expecting an ample salary and comfortable pension. Today, his 700,000 bolivars per month, plus a food bonus of 1.6 million bolivars (about $9.50 altogether) can’t fill the fridge at his grandmother’s house, where he lives. About 10 people from his department resigned in January. There are 263 plant operators remaining and 180 vacancies at the Puerto La Cruz refinery, he said. Absenteeism forces those who show up to work extra hours and burn precious calories. The lack of investment in equipment and maintenance has increased technical failures, almost all in the early hours of the morning, he said. When they occur, workers are too fatigued to act quickly, and accidents occur. And the worst part of it all is: Even if oil prices make a surprise comeback, years of favoritism, corruption and – now – international sanctions mean it’s unlikely Venezuela’s oil industry will suddenly blossom once again: For those who stay behind, the formerly wealthiest country in Latin America will probably remain mired in poverty, for as long as it’s ruled by a corrupt autocracy.